There’s nothing wrong with making a movie that spends its two hours as bright and sunny escapist fare. In fact, the whole reason we go to blockbuster movies is to be transported to the kind of place or experience only the movies can give us. In this respect, Mamma Mia! Here We Go Again capitalizes on a location and mood so fuzzy and warm, it could very well be out of a fantasy novel or comic book instead. It’s not up to the critic to tell mainstream audiences what his/her personal preferences for escapism are. A critic who personally enjoys superhero films but doesn’t like wealth fantasy or romance cannot just attach a bad review to a movie because it doesn’t fit his/her mold for what blockbuster entertainment should look like. In addition, a critic who enjoys the warmth of a Nancy Meyers movie cannot automatically attach bad words to a destructive action movie because it doesn’t fit his/her mold. Yet, so many times this is what happens. Instead, it’s the critic’s job to watch the movie and say whether it successfully pulled off its stated goal and will get the reaction it desires out of its target audience. Did the movie do what it set out to do? (Did it scare me? Did it make me laugh? Did it give me the action and heroism I desire?) The critic is also going to be speaking to more experienced movie-goers when describing inconsistencies in the script or spotty visual effects or specific instances in the acting that were noticeable. This helps an experienced viewer on the fence about a movie make an informed choice about whether to go. Film critics have really worn out their welcome over the last few years. A male-dominated field will slap good scores on derivative superhero entertainment because they cannot tell the difference between what suits their personal fancy and what actually makes a movie good or well made, and that same field will ridicule or demean comparable entertainment aimed at a female audience. Film critics no longer represent community advisers who give you the pros and cons about a movie and give you an informed recommendation on whether to see it. Instead, it’s filled with lines about personal desires for entertainment directed at the critic (when its reading audience doesn’t care what the critic personally likes, they just want to know whether the movie is worth it), and is also now filled with the political views of the critic and how a movie may bump up against their personal beliefs. The reaction to Sicario: Day of the Soldado is a great example of this. When I started watching a ton of movies every year, my friends or co-workers or classmates will ask “did you see this movie, what did you think about it?” My response will always be given with caveats, “if you like this sort of thing, then this will be the movie for you,” or if it’s a complex or socially daring movie, “I really noticed what the movie tried to say here.” I’m not talking about how it personally suited my idea for what blockbuster escapism should be, or how it fit my political leanings like a glove. 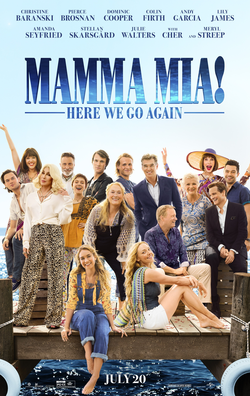 Let the positive reaction to Mamma Mia! Here We Go Again be a first step in correcting the current direction of film criticism and reminding critics that their job is to inform and discuss the movies and its pros and cons. Within the pros and cons will be using their experience to attempt to discern who the target audience is and whether they should see it, and also work to discuss the finer points of film-making to attempt to determine whether the movie is worth preserving down the line or worth pushing for accolades at the end of the year. Somehow, a male-centric field which has typically turned its back on this type of movie saw it in the same way I did, which is that this movie perfectly accomplishes everything that it sets out to do, and perfectly accomplishes transporting its target audience to a comfortable place for two hours. Maybe this can be the first impulse in returning the community nature of the film critic. The film continues the plot thread of the previous film, but Donna (Meryl Streep) is dead. Now, Amanda Seyfried’s Sophie has been redesigning the old hotel with a local manager (Andy Garcia) and planning for a massive re-open to high-class clientele. Her step-father and possible real father Sam (Pierce Brosnan) stays on the island with her as they mourn the loss of Donna. Her husband Sky (Dominic Cooper) is in a hotel management class in New York, and the long distance thing has been tough on their relationship. In addition, Sophie’s invitation to the grand-opening went unanswered by her other two dads, the Swedish sailor Bill (Stellan Skarsgard) and the British banker Harry (Colin Firth), but her mom’s two best friends Tanya (Christine Baranski) and Rosie (Julie Walters) will be coming as emotional support. As Sophie attempts to make her mother proud with the redesign of the hotel and also a possible pregnancy on the way, the movie intersperses these scenes with Donna’s life in her 20s. Lily James plays a young Donna, who graduates from Oxford and begins traveling Europe, meeting each of the three men who could possibly be Sophie’s father and also seeing the farmhouse that would one day become her hotel. We get some more ABBA hits, but we also reprise some of the really famous ones from the first film. All of the singing and dancing is fine, and although Amanda Seyfried consistently struggles to make Sophie believable, Lily James knocks it out of the park as a young Donna, just naive enough to make bad decisions, but just old enough to be dangerously promiscuous. The film’s wandering through her meeting each of the three men is met with varying success, as the young actors largely struggle to hold their place on the screen next to James and the younger casting of her two friends (notably the excellent Jessica Keenan Wynn as a young Tanya). Some of the locations are great, others are too heavily reliant on green screen. Cher shows up, which has its good and bad moments. But, I laughed and cringed throughout the entire time. When I wasn’t laughing, I was watching certain scenes through splayed fingers not believing what I could possibly be witnessing. With that are good performances, solid choreography, and plenty of fun in the sun. 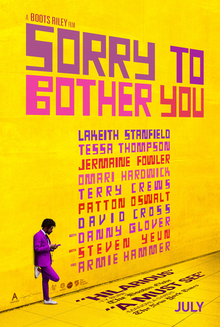 Hailed by many as this year’s Get Out, Sorry to Bother You is a directorial debut focused around drawing attention to racial divides, and in this case, economic inequality through a really interesting lens. It shows us a slightly futuristic Oakland, where a new company has taken over, marketing a low stress lifestyle, offering lodging and food for what essentially amounts to free labor. Low income people, sick of struggling to pay their bills and rent, regard giving away their life for free lodging is worth it. This “worry free” lifestyle promises something new, although obviously, free labor for bad lodging is not new. Worry Free CEO Armie Hammer pitches it like a fine salesman. Our main character Cassius Green (Lakeith Stanfield) accepts a job as a telemarketer, pitching series’ of encyclopedias to potential clients. While Cash just wants to do well an ascend to the level of “power caller,” using a white voice on phone calls to achieve it, his girlfriend (Tessa Thompson) and co-worker (Steven Yeun) are organizing protest movements against Worry Free, and want to organize a union for their telemarketing group. When Cash does eventually ascend to power caller, he sees that life at the top is quite literally filled with horror. This starts as a sort of black comedy that plays very specifically at racial tension and income inequality, and has a specific sort of indie charm that comes with a movie like this, set in the not-so-distant future. There are some laughs, and the performances are all good, especially Stanfield and Thompson, whose awkward physique and fiery artistic side clash in a really nice way. The movie then makes a specific choice to go down a science fiction route in the third act, which is one of the reasons this movie has gotten so much attention. To start, it seems like a well-made black comedy with a socially conscious center, but it goes for something much more rotten when Cash makes the connection between the Power Callers and Worry Free, where Armie Hammer’s character gets involved. Culturally, the wealthy pick off the downtrodden, but yet, the movie surmises that they don’t even view them as the same species, much less on equal footing sociologically. Cash traverses the disturbed upper-class of Oakland with a new-found confidence in himself and a desire to make generational wealth that his family had never had, but at the same time, risks leaving his friends and their struggle for a place at the table behind. In a way, this movie suffers a little bit from first film syndrome, where director Boots Riley clearly had a ton of ideas for how this movie was going to go, and felt like he had to get them all out, so there are some tonal clashes and overreaches, especially at the end. But, the movie ends up unique, somewhat persuasive, and worth recommending. 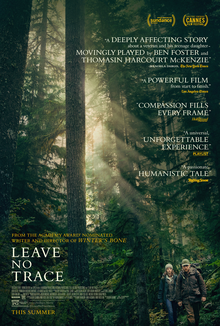 I’m not sure why it takes ten years for Debra Granik to get a new movie off the ground, but her long-awaited follow up to the damn good Winter’s Bone is an emotionally affecting and powerful dramatic adventure film. The film explores the important connection of family, the growth of a child from under its parent’s wing, as well as the lasting effects of what PTSD can do to a family. Ben Foster’s Will is a veteran, hampered by bad memories which plague his nights with powerful nightmares. He has one daughter, the teenage Tom (Thomasin McKenzie), and the movie makes clear that Will is a widower. At some point, Will took Tom out into the wilderness, and they survive off the land in the public forests and parks near Portland, Oregon. They make some money from Will’s veteran benefits, which they use to purchase supplies and food. This has been going on for a few years, but the division of child protection is hot on their trail. The movie showcases a few months of their lives, in and out of the forest, in and out of government housing, and so on. Will needs to be removed from society and its constraints, but the growing Tom may not want the same thing. The movie adequately showcases the kind of family love and support from Will to Tom enough to get the audience to sympathize with Will’s plight and for us to not view him as a monster. It’s obvious Tom needs more, and that it’s impossible to think he’s truly a good father when they live off of the land, but we respect Will imputing his knowledge of survival skills to his daughter and preparing her for crisis situations. The scene where we see that she’s up to date on schoolwork is important too. It takes us away from the child abuse angle and seeing Will as a villain to more adequately understanding one of the movie’s central points. When Tom is weighing what her life will hold for her, she is literally growing out of her father’s grasp, and the potential choice to move on and let herself grow comes as a literal representation of any child with their parent. Will’s inability to change manifests itself obviously in that he cannot rejoin society successfully, but the growing pains of father and daughter are set up to be as normal as any family. The movie is shot really well and does a great job in letting us really appreciate the landscape. When it gets cold in Olympia where they are, our characters really feel it and the audience hates their discomfort and danger. At the same time, the scenes of them in nature are a lot better than when they are outside of it, so a few sequences in the second act really slow things down. It’s more about the growth of the characters than any larger statement about parental rights. By the end, the movie had done its toll on me emotionally, and it’s wonderfully acted and directed. This is one of the most complete movies of the year.